Last Tuesday I visited the Siccas guitar store in Karlsruhe, Germany. And it was well worth the six hour drive from my home in Ghent, Belgium. Manuel Luchena proved a wonderful host offering me many different guitars to try and sharing lots of insights, despite my relatively low level of expertise as a classical guitar student. I made an enchanting journey through the diverse universe of sounds that different types of guitars can produce. We started with the Hanika Natural Torres but it only took a few seconds to realize that this guitar felt too much like a factory-made instrument for my taste. 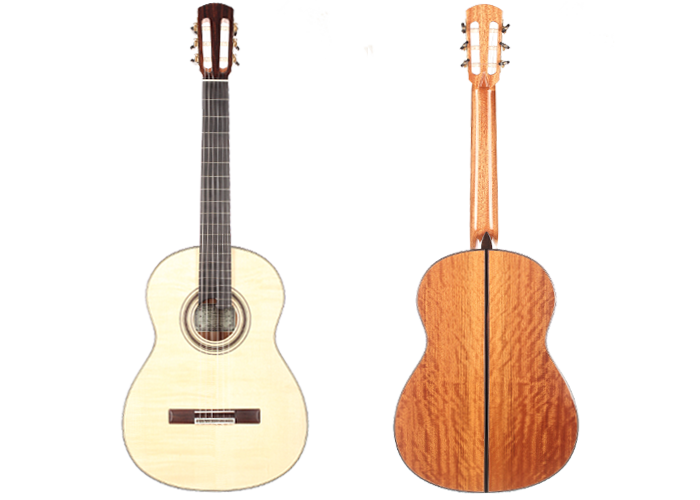 I am interested in a Torres style guitar but the Hanika has nothing to do with Torres really except for its fan bracing. I don’t know what it is exactly but an instrument made by hand by a single dedicated person just feels better. You can tell the difference by simply touching the guitar, even before hearing it. And the sound almost always proves you right. When it comes to factory-made guitars, in my albeit limited experience the cheaper models are more interesting than the high end ones. They tend to have more character. A more interesting encounter followed with several Milestones models, designed in Germany but built in China, presumably at a fraction of the price. The Milestones Torres Relic is a surprisingly nice instrument with a sort of worn look. But I think I would outgrow it quickly as a student. I need an instrument that is both comfortable to play and challenges me to learn. And while I am looking for a shorter scale guitar to fit my small inflexible aging hands, its 630 mm is just too short. Milestones creates guitars inspired by classic designs. They’re German style guitar is great too but not exactly what I need now. I also tried the Milestones Romantica Relic. Better than the cheap romantic guitar I have at home, and with a wider neck and proper tuners, it still felt similarly limited. 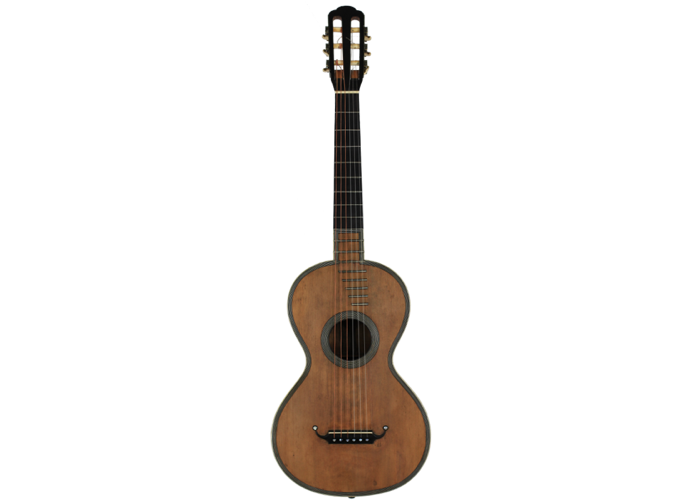 Manuel offered me an 1840 René Lacôte romantic guitar in comparison. What a difference! Despite its smaller scale and oddities like a fretboard level with the body, this instrument does offer a variety of sounds similar to that of classical guitars. At the complete opposite end of the spectrum, but also made in China was Yulong Guo’s Chamber Concert model. This guitar combines all the modern features in one instrument: a double top, lattice bracing, an arched back, an arm rest and an elevated fretboard. My god! The dark booming full sound that this instrument produces hardly reminds of a guitar anymore. It’s very dark and loud and a lot of fun to play but not suitable for my taste and need now. It would be wonderful to have around as a second guitar, though, to play for fun. The only other lattice braced guitar I tried had been built by my fellow citizen Karel Dedain. I had recently played a new classical model in his Ghent studio and was curious about this one. If only because I love the idea of having a guitar from a luthier in my town. What a difference with, frankly, most of the lattice braced guitars that I’ve heard! Unlike those, this instrument is subtle and refined, it sounds and feels much more like a “real” guitar (not like a piano, e.g. ), despite of the typical evenness of tone. Back in the world of Torres, I enjoyed Marco Bortolozzo‘s copy of one of the master’s designs a lot. Assuming the odd buzzing on the second string would disappear after a while (as it does on third on virtually all guitars), this is a beautiful instrument, in part due to the pale birdseye maple sides and back which both sound and look good. Its slightly smaller body also feels very comfortable to me. Another luthier I had been curious about ever since I started this exploration is Roy Fankhänel. And luckily Siccas had a recent model in stock! I had grown a bit sceptical about what I considered its too modern sound for my taste (as witnessed in online videos). But those reservations faded away after only the first seconds of touching the instrument. It sounds great and is very easy to play. But I feel too inexperienced for it. Which is just as well because it is quite a bit above my current budget. So Manuel offered me a guitar that costs more than twice that much! Oh man! I can see why Hauser guitars are revered the way they are. The Hauser III is almost intimidating. Such a mature instrument! It feels like some sort of father figure. I am definitely not ready for it! I can’t even begin to describe the unique sounds that come out. And I know I don’t have what it takes to make this instrument sing. I did note how the typically flat bottom of the Hauser design fits very snugly against my right thigh. Nice! Also from Germany but very different, was the guitar built by Cornelia Traudt. A very unique instrument with oddly thin basses and clear trebles. It felt as if the volume increases as you go down the strings. Peculiar. Interesting. As we were deviating from the purchase path into an exploration of sound, Manuel handed me a John Ray encouraging me to appreciate what he called the dry sound of guitars made in Granada. As he noticed I wasn’t completely convinced, he gave me a Eduardo Durán Ferrer guitar, also built in Granada. Wow! Playing it feels like warm weather! Sitting in the sun. I can see what he means by dry now. Somewhat shorter sustain than what I’m used to but beautiful in its own way. This guitar also had a very thin D-shaped neck profile which worked really well with my (bad) habbit of resting on the tip of my left thumb. To make the comparison with Madrid he first let me taste a Granada-built cedar top guitar (so far we had only tried spruce tops, because that’s what I’m interested in at the moment). Still “dry” despite of a slightly longer sustain. But the difference with the cedar-topped Bernabé Concierto is remarkable indeed! The guitar from Madrid sounds much more like the classical guitar that I’m familiar with: rich, round, versatile. But that doesn’t make it better. And that was the most interesting outcome of this journey for me: that there’s many different types of guitars and that many sound interesting for one or another reason, without one being particularly better than the other (with the possible exception of the Fankhänel and the Hauser that I don’t feel experienced enough to judge yet). To experience all these sounds first hand, has been a true joy. And I feel so much better informed now. I’m also secretly proud that my fellow citizen’s work holds its own even among that of so many other great artisans.